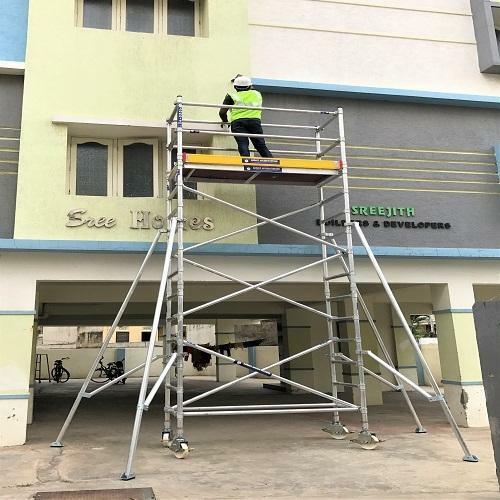 Leveraging the skills of our qualified team of professionals, we are instrumental in offering a wide range of Narrow Span Aluminum Scaffolding. Situated at Vasanth Nagar, Hyderabad, Telangana, “Adroit Access Systems” has the ability to cope up with the dissimilar requirements of our clients in given time frame. We are a Partnership based entity that is instrumental in the operations of manufacturing. Since 2015, we are growing rapidly in the market to serve the qualitative products in the marketplace. The assortment of products we deliver for our customers include Stairway Scaffolding, Scaffold Tower, Work Platform and Scaffolding Spare Parts. Moreover, we have catered to numerous organizations in the past and have a brilliant work alliance with all of them with no complaints from our customers.